For the better part of a quarter, the Cavaliers and Warriors gave us the gloriously competitive game these playoffs have so been lacking. 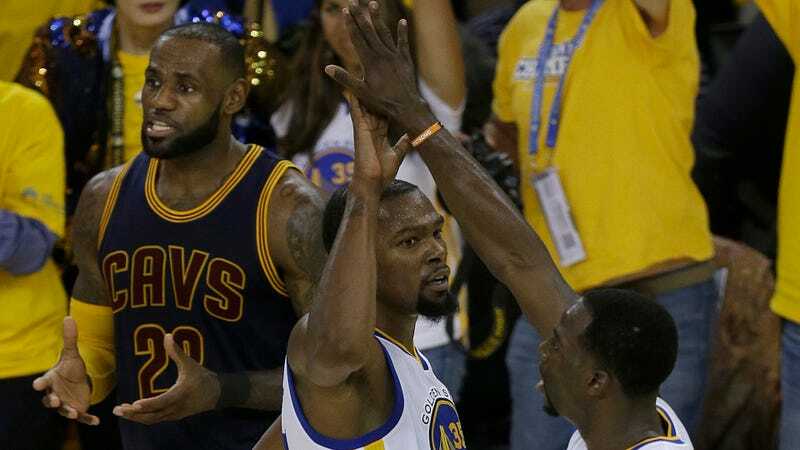 Then Cleveland suddenly became unable to defend Kevin Durant in any capacity, Golden State looked every bit as unstoppable as they’re supposed to be, and it all went to hell. Though the game felt like it was all but decided by the middle of the second quarter, as Durant racked up 23 first-half points with seemingly relative ease, Cleveland was down by just eight at the half. It was (ugh, but of course) the third quarter that really did them in, with the Warriors widening the gap to 21. It is, really, as much a testament to the Cavs’ ability as anything that they managed to look remotely competitive for as long as they did. (A testament to LeBron and Kyrie Irving, who scored a combined 52 while the rest of the team put up a total of 39.) As soon as the Warriors locked in, they were damn near flawless in just about every respect of their game, barreling on through to an eventual 113-91 victory. One particularly telling stat is that they had just four turnovers to Cleveland’s 20; there are other similarly gaudy numbers, all of which feel very demoralizing to anyone hoping for a narrative other than the boring, predictable dominance of the Warriors here. Gross. Game 2 is Sunday. LeBron James On Racist Graffiti At His House: "No Matter How Famous You Are...Being Black In America Is Tough"